Married Name Her married name was Gordon. Name Variation Joan Stewart was also known as of Scotland. Joan Stewart married (?) Gordon. Joan Stewart was born in 1428. She was the daughter of James I of Scotland and Joan Beaufort. Joan Stewart died in 1493. (?) Gordon married Joan Stewart, daughter of James I of Scotland and Joan Beaufort. John Gordon was born in 1450. He was the son of (?) Gordon and Joan Stewart. John Gordon died in 1517. Alexander Gordon was born in 1476. He was the son of John Gordon. Alexander Gordon died in 1513. Married Name Her married name was Ogilvie. Jean Gordon married (?) Ogilvie. Jean Gordon was born in 1496. She was the daughter of Alexander Gordon. (?) Ogilvie married Jean Gordon, daughter of Alexander Gordon. Married Name Her married name was Barrie. Margaret Ogilvie married (?) Barrie. Margaret Ogilvie was born in 1819. She was the daughter of (?) Ogilvie and Jean Gordon. Margaret Ogilvie died in 1895. (?) Barrie married Margaret Ogilvie, daughter of (?) Ogilvie and Jean Gordon. James Matthew Barrie was born in 1860. He was the son of (?) Barrie and Margaret Ogilvie. James Matthew Barrie died in 1937. Scottish Novelist. 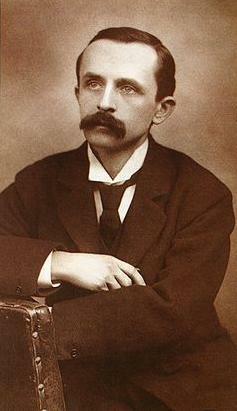 James Matthew Barrie wrote the stories of Peter Pan and The Lost Boys. His college acquaintances include Arthur Conan Doyle and Robert Lewis Stevenson, with whom he wrote for the university newspaper. Henry Neville married Joan Bourchier, daughter of John Bourchier and Marjorie Berners. Henry Neville was born in 1437. He was the son of George Neville and Elizabeth de Beauchamp. Henry Neville died in 1469. Thomas Neville was born in 1468. He was the son of Henry Neville and Joan Bourchier. Thomas Neville died in 1546. Married Name Her married name was Winslow. Ellen Neville married (?) Winslow. Ellen Neville was born in 1508. She was the daughter of Thomas Neville. Ellen Neville died in 1547. (?) Winslow married Ellen Neville, daughter of Thomas Neville. Catherine Winslow was born in 1532. She was the daughter of (?) Winslow and Ellen Neville. Catherine Winslow died in 1607. Edward Winslow was born in 1560. He was the son of Catherine Winslow. Edward Winslow died in 1631. Edward Winslow was born in 1595. He was the son of Edward Winslow. Edward Winslow died in 1655. Mayflower Passenger. Edward Winslow served as the governor of the Plymouth Colony. He also signed the Mayflower Compact. Married Name Her married name was Neville. Joan Bourchier was the daughter of John Bourchier and Marjorie Berners. Joan Bourchier married Henry Neville, son of George Neville and Elizabeth de Beauchamp. John Bourchier married Marjorie Berners, daughter of Sir Richard Berners. John Bourchier was born in 1415. He was the son of William Bourchier and Anne of Woodstock. John Bourchier died on 16 May 1474. Lord Berners. John Bourchier, 1st Baron Berners KG (d. May 1474), was an English peer. Bourchier was the fourth son of William Bourchier, Count of Eu, and his wife Anne of Woodstock, Countess of Buckingham, daughter of Thomas of Woodstock, 1st Duke of Gloucester. Henry Bourchier, 1st Earl of Essex, and William Bourchier, 9th Baron Fitzwarine, were his elder brothers. He was knighted in 1426 and in 1455 he was summoned to the House of Lords as John Bourchier de Berners, which created the title of Baron Berners. In 1459 he was further honoured when he was made a Knight of the Garter. He also served as Constable of Windsor Castle from 1461 to 1474. [S369] Encyclopedia website, by compilation, http://en.wikipedia.org/wiki/John_Bourchier,_1st_Baron_Berners. Married Name Her married name was Bourchier. Marjorie Berners was the daughter of Sir Richard Berners. Marjorie Berners married John Bourchier, son of William Bourchier and Anne of Woodstock. Marjorie Berners died in 1475. Sir Humphrey Bourchier was the son of John Bourchier and Marjorie Berners. Sir Humphrey Bourchier married Elizabeth Tilney circa 1466. Sir Humphrey Bourchier died in 1471 at at the Battle of Barnet. Married Name 1483 As of 1483,her married name was Tuchet. Margaret Dayrell was the daughter of Sir Richard Dayrell and Margaret Beaufort. Margaret Dayrell married James Tuchet, son of John Touchet and Anne Echingham, in 1483. Sir Richard Dayrell married Margaret Beaufort, daughter of Edmund Beaufort and Lady Eleanor Beauchamp. John Tuchet was born in 1483. He was the son of James Tuchet and Margaret Dayrell. John Tuchet died in 1558. Married Name circa 1488 As of circa 1488,her married name was Tuchet. Joan Bourchier was the daughter of Fulk Bourchier and Elizabeth Dinham. Joan Bourchier married James Tuchet, son of John Touchet and Anne Echingham, circa 1488. Fulk Bourchier married Elizabeth Dinham. Elizabeth Dinham married Fulk Bourchier. John Tuchet was born circa 1490. He was the son of James Tuchet and Joan Bourchier. Henry Naunton was born in 1549. He was the son of William Naunton and Elizabeth Wingfield. Henry Naunton died in 1599. Married Name 11 November 1744 As of 11 November 1744,her married name was Mauzy. Married Name 11 November 1744 As of 11 November 1744,her married name was Mauze. Ann Withers was born on 2 October 1722 at Virginia. She was the daughter of Captain James Withers Sr. and Elizabeth Keene. Ann Withers married Henry Mauze II on 11 November 1744.